I can't say enough about Molly Red Pepper, it is a beautiful red. The body of the desk shown above was stained with the Molly Red Pepper. 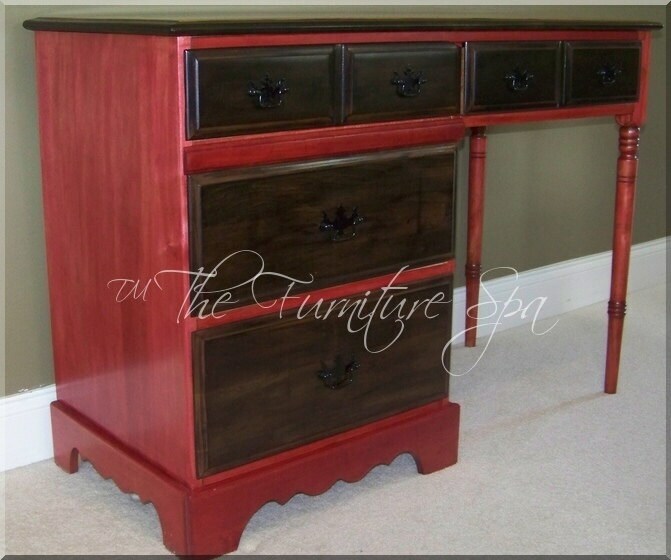 Once the maker of Unicorn SPiT saw pictures of the desk she exclaimed, "Molly Red Pepper is my new favorite color". The Furniture Spa is excited to announce that we now carry the full line of Unicorn SPiT for sale. Unicorn SPiT is an amazing non-toxic wood stain and glaze in one. There are currently 11 vibrant colors to choose from. It comes in an 8 ounce container and is ready to use. The stain can be applied to wood, glass, metal, cork, and more with your bare hands or a sponge brush if you prefer. Unicorn SPiT smells like Jasmine so you can use it indoors too. Love this stuff - using it on many different things! So excited to find this Molly Red Pepper color as it's very hard to locate (I believe it's been discontinued by the company in lieu of a new red hue to come in the months ahead)! I placed my order with The Furniture Spa late one night and by the time I woke early the next morning it had already been shipped!!! I was thrilled!! Excellent service and shipping! My products arrived in perfect condition and I can't wait to use them! Thank you so much for outstanding products and service! Excellent customer service and speedy delivery. Loving my Unicorn SPiT! Molly Red Pepper!